Microsoft has officially entered the wearables space. In a move not many saw coming, the company known for the Xbox One just announced the release of the Microsoft Band, its very first smart band. There are several blog posts out detailing the new wrist ware but we've narrowed down the most important things you need to know. The Microsoft Band weighs in at 2.12 ounces with a width of 19mm and thickness of 8.7mm. The display screen is 11mm by 33mm and features a touch-enabled TFT full-color display. The band has 64MB internal storage and an ARM Cortex M4 MCU processor. There are ten sensors built into the device: an optical heart rate sensor, 3-axis accelerometer, gyrometer, GPS, ambient light sensor, skin temperature sensor, UV sensor, capacitive sensor, microphone and a galvanic skin response sensor. You can also set email, text, calendar, social, incoming calls and alarm notifications to pop up on your wrist. Microsoft has also partnered with several companies like Starbucks - which will let you scan your wrist instead of your Starbucks card. The Microsoft Band also syncs data with RunKeeper and MyFitnessPal, plus Gold's Gym, where you can get workout prompts while tracking your fitness. You'll also get access to Cortana if paired to a Windows Phone 8.1 - meaning you can take notes or set reminders with your voice. She can also give driving directions and more just like she would from a mobile device. Along with the Band, Microsoft has a new health initiative in the form of an app called "Microsoft Health." Microsoft Health pulls data from multiple health and fitness devices into one cloud location. From there, it will recommend different workout plans, sleeping routines and more based on the information. The "Intelligence Engine" will continue to learn from your habits and over time, give you even more precise advice. However, the only devices and services you can use with the app are UP by Jawbone, MapMyFitness, MyFitnessPal and RunKeeper. Microsoft Health is available to download on Android, iOS and Windows Phones. The Microsoft Band is available starting October 30 in limited quantities from MicrosoftStore.com and physical Microsoft Stores in the US for $199. So far a global rollout hasn't been announced, but expect it soon. 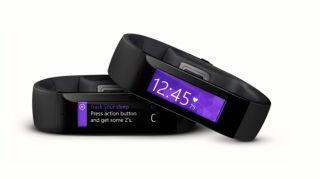 Interestingly, the Microsoft Band will be a cross platform fitness tracker. The band will work with Windows Phone 8.1, iOS 7.1 and 8, and Android 4.3-4.4 devices all over Bluetooth. Some features, like Cortana on the Windows Phone, require a data or Wi-Fi connection. It seems like Microsoft is in a good position to join the top wearables. Though it's expensive, it's packed with a ton of sensors and could almost be a smartwatch because of all its different notification features. In fact, the Microsoft Band comes close to acting and looking like the Samsung Gear Fit. But the band has the upper hand in allowing cross platform compatibility, having GPS and looking a tad less bulky. The addition of a health platform is also nice and provides quite a bit of potential with its ability to constantly learn and suggest different things to you. This app could very well be the the band's defining feature setting it apart and above the rest of the pack. So far, it looks like a nice first attempt from Microsoft.